We would like to welcome Carolyn Ketchum to WeAreCoconuts.com! She will be creating delicious recipes each month for all you from now until June. Carolyn is the writer and recipe developer for All Day I Dream About Food, a mostly low carb, gluten free food blog. One thing I have come to realize over the past few years is that almost any food item can be made a little healthier, as long as you are willing to make it yourself. You can start with almost any recipe, any family favorite, and pick a few of the less healthy elements to cut out or reduce, while subbing in some healthier ingredients to up the nutritional quotient. Cut back on the processed flours and sugars, add in some fiber, sub in healthy fats like extra virgin coconut oil, and you have yourself a much healthier snack or meal. It’s little changes like this that can put a healthier diet within reach for all of us. Scones have always been a weakness for me. I love nothing more than to munch a freshly baked scone while sipping my morning coffee. So when I decided to go low carb and gluten-free to manage my diabetes, I knew I had to find a way to make scones much healthier. At first, I despaired of ever achieving the crumbly, tender texture with my alternative ingredients. But as I gained some skill, I also gained some confidence, and I finally began to bake great scones again. And now they have the added advantage of actually being good for me. Coconut oil makes a great addition to baked goods like scones and muffins because it produces a tenderness you just can’t get with other fats and oils. Melt in your mouth is the only way to describe it. Coconut oil also doesn’t mind hiding in the background of the flavors if you choose to play it down. But it also performs deliciously when you choose to play it up. 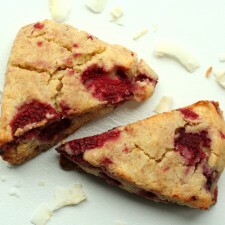 For these scones, I wanted that true coconut flavor to stand out, because I love it. And coconut and raspberry are a terrific combination. Feel free to indulge with your morning coffee, because these scones are actually a part of your healthy diet. In a large bowl, whisk together almond flour, flax seed meal, shredded coconut, erythritol, baking powder and salt. Stir in raspberries until well distributed. Turn out dough onto a cookie sheet lined with parchment paper and pat into a rough rectangle, 6 by 8 inches. Cut into 6 even portions, and then cut each portion in half diagonally to make 12 triangular scones. Gently separate scones and place around cookie sheet, leaving at least 1 inch between them. Bake 28 to 30 minutes, or until golden brown and firm to the touch. This recipe looks so good but the pin is not working for Pinterest because there is no picture attached to it…. These sound great! What is the nutrition/carb information? According to Carolyn: Each serving has 8.6 g of carbs and 4.8 g of fiber. Total NET CARBS = 3.8 g.
Diane, we think so too! What other types of recipes would you like to see? Just made these and even I pulled it off…a 62 Year old male! I have a sweet tooth, partly why I’m a type 2 diabetic so I might make ’em a bit sweeter next time. The level of sweetness is highly subjective…that I’ve learned. Thanks yet again to Carolyn for a wonderful recipe. You’re wonderful. Frank, we’re glad you made them and that it was a success! Keep checking back for new recipes that might satisfy your sweet tooth! Thanks, Frank. And I agree, sweetness depends on the person. Hope you do make them again, with however much sweetener suits you! Dear Carolyn, I love your recipes, but I have recently learned that the newest research projects are repeatedly discovering that artificial sweetener’s including Stevia may not increase blood glucose, but they push up your insulin levels regardless. As higher levels of insulin lead to insulin resistance and weight gain, we diabetics need to avoid sweeteners as much as possible, or our diabetes worsens. I’d love to see more dessert recipes that did not rely on artificial sweetener’s, and yet can stay low carb. Perhaps that could be a new blog focus for you. An extremely lucid and well written explanation of this is in Dr. Jason’s new book obesity code. There have to be ways to have dessert that won’t be bad for us! My husband and I are literally eating these right this moment and enjoying with our cup of coffee. These are simple to make!! Almost immediate gratification. Loved them! We’re so glad to hear this! Did you find any other recipes on our site that you may try? Hi there 🙂 these sound and look great! I was trying to think of something I could bake for my colleagues at work for my treat when it’s my birthday (in the Netherlands it is tradition for the birthday person to treat those around him/her … weird I know ^_^ ) and I think these just might be the ticket. Thanks! Nikki, that sounds like an awesome tradition because it ensures you get your favorite! When you make them be sure to let us know how they turn out! In scones one thing that makes them delightful is the flakyness. is there a reason you melt the coconut oil instead of encorporating it by cutting it in like you would butter? Working with gluten-free ingredients like almond flour, you can’t treat it the same way as you would regular flour. It won’t combine well, cutting it in like that. And these won’t be all that flaky, actually. They are more tender than that. But really delicious nonetheless! If you want to adapt the recipe for wheat flour, by all means try cutting it in, it might be the best way! We so so glad to you enjoy them! Delicious! Used white flour instead of almond, coconut milk/water mix instead of almond milk, sugar instead of erythritol, and ditched the flax (we like to eat healthy, but not that healthy 🙂 and they turned out fabulously! Yum, yum, yum! Bought a jar of the coconut oil today and had to check out the website. loving all these recipes. this one sounds so delish and i will be making them this weekend! can’t wait to taste them. the sweetener i’ll be using will be coconut palm sugar. We are so happy that you came across our blog! I’ve never personally tried using coconut palm sugar, so let us know how they turned out! Could you use coconut flour in place of the almond flour? If so, I imagine you’d have to reduce the amount? I really don’t like the taste of almonds, which makes things pretty tough with low carb recipes! Great recipe!!! I’m not a fan of raspberries so I used blueberries!!! Thanks a million. Love your site!! Would there be in issues using fresh raspberries? I would really like to try this. Love scones! Amy – the only “issue” with fresh raspberries over frozen is that fresh ones may be crushed during mixing. what is the complete nutritional values on these? Calories? Sugar? fiber? fat? In one of the above comments, you mentioned the following: Each serving has 8.6 g of carbs and 4.8 g of fiber. Total NET CARBS = 3.8 g.
This comment seems different that when I calculate Net Carbs based on this comment it works out to be 8 net carbs (13g carbs minus 5g dietary fiber). Which is correct? Or is it just mean not understanding the 2 comments? Eating one right now-OMG…..absolutely delicious!!!!!! Better than ANY other scone I have EVER had. 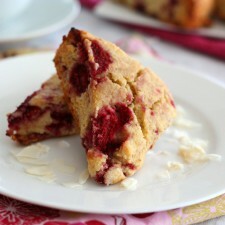 I never comment on blog pages but I had to today because these scones were just that amazing. I used fresh raspberries and it made the scone right around each berry a teensy bit mooshy but the taste was out of this world. Thanks! Stephanie – we’re so glad you liked them! I never write comments but I read many before I make a new recipe. That being said, I had to tell everyone how FABULOUS these are!!! I didn’t have raspberries so I used blueberries. I will make these again and again they are that good! Worst part is trying to limit yourself to 1-2 per day! Wow, these are amazing!! Thank you! I had some freeze-dried raspberries on hand and used those. They came out well, but frozen would probably be juicier. Since my dried berries weren’t very sweet, I added a splash of rasberry extract and then a bit of coconut sugar to the tops of each scone and it was perfect! I did have quite a bit of difficulty moving the triangles around to separate them before baking (and was making a huge mess out of my parchment paper), so I think next time I’ll scoop them like cookie dough, and then pat them down into triangles with my hands. I know I’ll be making tons of variations on the raspberry flavor – this is now my go-to breakfast treat! We hope they were amazing Frances! I made these for a Christmas tea, subbing cranberries for the raspberries and adding orange zest and orange extract. They were very good. This is the third low-carb scone recipe I’ve tried, and it definitely has the best texture and flavor. Thanks Carolyn! So glad you liked them! They look delicious! do you have the nutritional breakdown for them….in particular, the carb count for one serving? Hi Kathryn, apologies for the delay! Each serving has 8.6 g of carbs and 4.8 g of fiber. Total NET CARBS = 3.8 g.
These were amazing. I used 1/3 c swerve and will be making they for a long time to come. Is a serving 1 or 2 scones?